Jaya! Come back to work and make these movies! I think they would all be wonderful. These are “real” possible roles for her, so stuff that she could play at her current age, opposite other actors who are also her current age. And I have her co-star with Amitabh a lot because I think he is tied with Sanjeev Kumar for best chemistry with Jaya. And Sanjeev is dead. But even within these limitations, there are still so many options! Widow Rediscovering Herself Marijuana Film: We open with the funeral. Abhishek has come to take her back to New York with him, the small apartment in Bombay that she shared with Amitabh (obviously cameoing in flashbacks as the dead husband) for 50 years is gone. All her things are gone as well, except for what she can fit in a suitcase. And she is taken to a new country and put into a bedroom in her daughter-in-law’s house. The daughter-in-law is not Aish, because I don’t want to make this a two heroine film and she is too big of a name. Let’s say Prachi Desai, I like her and they were good together in Bol Bachchan. Oh! And let’s say that there is underlying family tension, because Prachi is his second wife, an ABCD doctor, unlike his first wife who was a perfect traditional girl from India he married at 21. Everyone is very nice to her and just wants her to be happy, but she herself doesn’t know what she needs to be happy. Until she happens to see her college student grandson eating edibles. She tries one before he can stop her, and it has almost no effect. Which surprises him, but then she says “oh, this is just like Bhaang!” And then he is actually interested in his Grandma for once, and she gets interested in the project, and makes him Bhaang. And by the end of the weekend (Abhishek and Prachi have left for the weekend which is why her grandson is home from college, to keep her company), the grandson and all his friends are hanging out with her all over the house, listening to her tell stories about the wild times she had with his grandfather when they were young in Bombay. Abhishek and Prachi are furious and yell at the grandson, but Jaya defends him, saying she was happy, he treated her like a person, not an old lady. And finally when the grandson declares he isn’t going to live under their roof any more, she declares that she isn’t either! And the two of them leave together, her with her sad suitcase and him with his backpack. They end up staying at the house of his only friend who lives in his own house instead of a dorm. He also happens to own a marijuana dispensary. Soon enough Jaya is working for him, and not only that, is the face of a massive city wide ad campaign. Prachi finally goes to visit her, and asks her to come home. Abhishek can’t ask, because he can’t admit he needs his mother when he is supposed to be the one taking care of her. Jaya says she doesn’t want to come home, she can’t go back to being “just Abhishek’s mother”. But she is glad Prachi came to talk to her, and she wants to ask Prachi’s help with something. The grandson is happy working at the dispensary and not going to college, and Jaya knows she can’t get him to listen to her. But he will listen to Prachi. Prachi demurs, says she “isn’t his mother” and is “no good at being a mother”, and Jaya lists off all the things she has noticed about her, how she insists on family dinners, how she makes sure Abhishek and his son have annual father-son vacations, how she has decorated the son’s whole bedroom just as he wanted it. She is as much his mother as anyone, and just because she isn’t able to have children biologically, doesn’t make her any less of one. Certainly she is more his mother than the woman who gave birth to him and then left two years later with another man, never to return. It’s Jaya’s movie, so we don’t see the Prachi-grandson conversation, just the aftermath of Prachi supportively helping him to the car and driving him home, where he and Abhishek silently embrace. But the lingering issue is still between Jaya and Abhishek. Prachi tries to talk to him, to say that he should at least visit Jaya, she is so happy now, and he won’t even talk about it. Until the day that Prachi calls him for work because they got “the call”. He rushes to the hospital, where they pick up their new baby, who they have been waiting on approval to adopt this whole time (occasional phone calls and conversations in the background suddenly making sense). And Prachi suggests they name it “Amitabh”, and Abhishek starts to cry. Prachi comforts him, and just at the perfect moment, Jaya arrives, because a mother always knows. And she and Abhishek finally have a heart to heart and he admits that it feels like by her moving on to a new life, she is leaving Amitabh behind, like he never existed, and Abhishek doesn’t know how to handle that. And Jaya tells him that her life with Amitabh will always be the best years of her life, and he will always be the love of her life, but she can’t just stop living. But she does want to move back and help take care of her new grandson, if he will let her. And we end with a big happy Holi party, catered by Jaya’s dispensary, with Abhishek and Prachi dancing together, and the older grandson dancing with the baby, and Jaya having a happy vision of Amitabh smiling at them all. Cheated Wife Getting Vengeance Movie: Full disclosure: this is partially based on Grace and Frankie, the Netflix show which is not nearly as good as The Golden Girls, but also provides plot ideas for women of a certain age. At least the central plot idea. That late in life shock of learning that your husband is Gay and has been cheating on you for decades and never really loved you. That is something I want to see Jaya play! I’m not going to make Amitabh be the cheating husband. We’ve seen that, that was Silsila. Let’s make it Dharmendra. And his boyfriend can be a younger man, let’s say Jackie Shroff. Dharmendra has a biggish age difference with Jaya, which we can put into the plot. We can even start with a fuzzy flashback of their relationship, Jaya as a tiny teenager (maybe Alia? Or Parineeti with aged down make-up?) having her formal “first meeting” with much older Dharmendra (Played by Abhay), who is trying to explain away why he is still unmarried at 40. And then we can have a photo montage filling in the gaps, she was a dutiful wife for 40 years, and it wasn’t a nightmare. She became closer to his mother than he was, she loved her kids and loved raising them, and her oldest got married and stayed at home with his kids and she transitioned right to being a grandmother from being a mother. Only for the past few years, since the kids all moved out for good, she has been lonelier and lonelier. It’s just her and Dharmendra and he’s never around. And now he is telling her that he has been living a lie their entire marriage and he can’t do it any more. At first the kids are sympathetic to her and angry at their father and invite her to live with them and so on. And she considers it, but at the divorce lawyer’s office she meets Hema Malini, Jackie’s soon to be ex-wife, who tells her that they have spent their entire lives living for others, being “good wives and mothers” because that is what their parents told them would make them happy. And that is what got them into this mess, so no more! Jaya and Hema railroad over their scared divorce lawyer, the only one they can afford, a scared new female graduate played by the same actress who was Jaya in the flashback (meta comment about how “you remind me of myself at your age”). They fire her up and give her the confidence to go in to the first meeting with Dharmendra and Vinod’s lawyer and get the one thing Dharmendra and Vinod most wanted to keep, their secret love nest they have had in the city all these years. But while that might hurt them the most, it doesn’t give Jaya and Hema any money to pay their lawyer (let’s just say it’s Parineeti). So instead they offer to pay her by letting her live with them. Because when they get drunk that night she let loose about how frustrating it is living at home with her parents constantly trying to marry her off. Not only do Hema and Jaya and Parineeti end up living together, Jaya and Hema also end up helping her find clients, by trolling the religious meetings and grocery stores and other places where similarly older housewife types hang out and talking with them about how it might be possible to have the house and the satellite soap operas and everything else that makes life worth living, without having to deal with the man who comes home and belittles you and never says thank you and generally just makes life horrible. But it comes to a head when Parineeti falls in love. In an awkward shy way. She brings home a friend/colleague from law school and is very clear that he is JUST A FRIEND. Let’s make it Kanan Gill, because he can do smart and awkward beautifully. And I have a crush on him. Hema and Jaya immediately see that the two of them like-like each other, but are too awkward to move forward. So they arrange for them to both get a little drunk and take them out to a club, where Hema and Jaya do a club song dance number, and manage to maneuver Kanan and Parineeti together. Everything is great for a while, but then Parineeti comes home crying, and when they ask why, she says it is because “Kanan proposed!” But she doesn’t want to quit working and she isn’t ready to have kids, and she doesn’t even want to leave this lovely apartment with Hema and Jaya. So Hema and Jaya realize that they have accidentally poisoned Parineeti against marriage. They explain that it doesn’t have to be like that, they made huge mistakes in getting married to a total stranger they didn’t even know, when they weren’t even old enough to truly know themselves. But with Parineeti and Kanan, she can talk this over with him and figure it all out together and build the marriage they want. And the happy ending is Parineeti’s wedding, with cameos from Jaya and Hema’s kids, and their ex-husbands. And then a quick flashforward to the rest of their life, Kanan moves in with the ladies, Parineeti has a kid on their 2nd anniversary and goes back to work, with Jaya and Hema serving as nannies, and when the second child is born, Kanan quits his job because Parineeti’s business is successful enough to support them all, and Kanan stays home and takes care of both kids. And Hema and Jaya continue leading their happy single lives together. Oh, and did I mention that there was a brief sequence in the middle where Jaya has a fling with Amitabh but they both agree they would rather keep it light and just sleep together sometimes instead of getting serious? Late in Life Spinster Romance: Jaya is retiring after 40 years at an all girls school. Her students all love her, and so do her fellow teachers. Everyone is sad to see her go, and also excited to ask what she is going to do next? She was always such an inventive and exciting teacher, everyone loved her classes, what’s next? Write a novel, become an actress, professional painter? Jaya just smiles mysteriously. But when it is all over and she is sitting on the train, she finally pulls out her notebook and writes in it “steps to getting a husband”. And then she writes down “step 1: make-over”. She gets off the train in a small town and asks directions to a villa she has rented. And then spends an evening looking at make-up tutorials and trying on clothes she had hidden in her suitcase. They next day she wakes up with make-up everywhere and crazy hair and blue jeans under a sari. And screams because she sees an old caretaker looking through the window. It’s Amitabh! And then he has to come in and rescue her because she fell over and hurt her hip. Amitabh helps her up, and helps her to the doctor, who gives her some pain drugs and in her drugged out state, she tells Amitabh the whole story, how she had all these proposals when she was young, and turned them all down because she wanted to travel the world, and paint and act and do all these things. And then the years went by, and she ended up teaching in a girls’ school, and the proposals still came in, single fathers and the new gym teacher, but how could she settle down to one man when she had 200 girls to take care of? And then she realized it had been 15 years since the last proposal and now she was retiring and had no one. So she is going to do whatever it takes to get one of those men back! The next day, Amitabh helps her home and references what she said on drugs, and she realizes he knows everything. She is super embarrassed, but Amitabh suggests maybe he can help her, since it sounds like a lot of work. Especially since she will be recovering with a cane for the next two months. And, of course, they slowly get close, at the same time that he helps her get her hair cut and try on different outfits, and learn to speak slang “Hinglish” like the cool people do. But there are also moments that they sit together under the night stars and Amitabh recites poetry. Or when Jaya teaches him to waltz so he can be her dancing partner. And eventually, even though he is just an old caretaker who is always talking about his many many dead wives and multiple children (it’s a running gag, how he keeps changing the name of the wife, then saying it was a different one, and giving another horrible story of her death), Jaya realizes that he is the one she wants. She realizes this on the way to her meeting with the fancy older industrialist who she met online. She comes into the room and immediately starts explaining that she can’t actually be here, because she is in love with someone else, even if he is just a caretaker who lives in a rented room and has no degree and no savings and a million children, she just wants to live in that room with him and sit out under the stars every night. 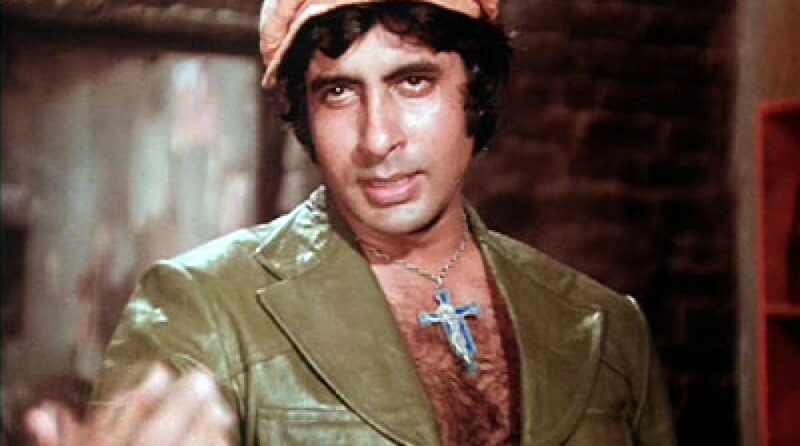 And of course, it’s Amitabh! I mean, the fancy older industrialist is. And we get a quick flashback to him going off for a morning jog from his luxury vacation mansion, hearing a sound from the small villa as he passes it, peering through the window, and of course falling in love with Jaya at first sight. And deciding to be the simple caretaker, because that was the man she was comfortable with. And now he wants to be that simple caretaker for her for the rest of her life. Only, in a really really big house. This entry was posted in Uncategorized and tagged Fanfic, Jaya Bachchan by mredlich21. Bookmark the permalink. I want these all made!